The first thing you will notice is that this site is not dull. There is a certain tranquillity and relaxed feel about this site, which will be sure to have you relaxed. To be honest, it’s the perfect environment to sit around at home, relaxing and play some top-notch bingo games. Speaking of bingo games, whatever your preference you are bound to find some great games here. You will find everything from 30 ball speed bingo to traditional game variations such as 90 ball bingo. It’s not just bingo games, you will find lot’s of leading slots brands here as well, with the likes of Shaman’s Dream and Irish Luck amongst their offerings. You will also be pleased to hear that you can try out several of the games free of charge too, so you don’t have to break the bank. Simply fill out the login, fund your account with the welcome bonus and start playing all your favourite slots games! If table games are your thing, you will also want to check out top casino games such as Blackjack, Keno or Roulette. 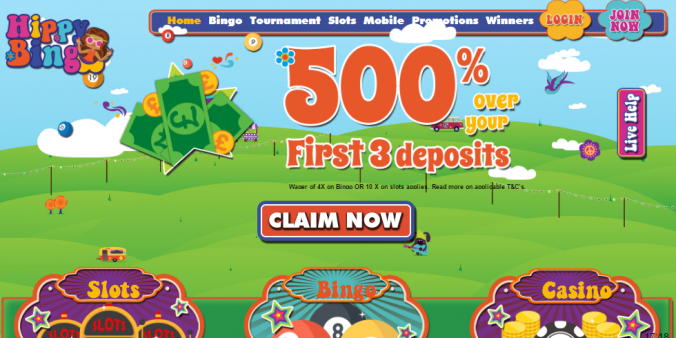 Get started with Hippy Bingo now and receive a 350% first deposit bonus. This means if you deposit just £10, you will receive £35 extra and a total of £45 to play with. You will be able to claim the cash without putting in a coupon or bonus code. Wagering requirements are 10x on slots and 4x on bingo, not bad! Hippy is not short of bingo promotions, however, these are pretty much all network wide, so you won’t find much difference between this site and other network sites such as Buttercup Bingo, Now Bingo and Comfy Bingo. Nevertheless, you will find things such as up to 20% cashback, daily raffles and a monthly slots tournament giving away £10,000. There are also daily, weekly and monthly jackpot games, where you will find guaranteed prize pots of up to £1000. If you like playing bingo on the move, you will be able to do so with the Hippy Bingo mobile app. No download is required, you can simply play straight from your smartphone or tablet.